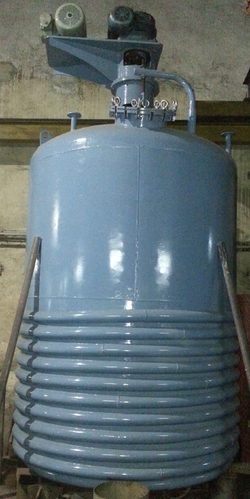 We offer a wide range of high quality of Limpet Coil Vessel to our valuable customers. These products are manufactured using latest technology and advanced machinery. These equipments are fully tested hydraulically as per design pressure, to ensure high standard of quality of these products. These products are known for their superior maintenance and smooth operation. We offer an effective after sale service by our fully trained and competent engineers. Limpet Coil Vessel: Limpet Coil Vessel can be made of M.S. or Stainless Steel as per the Requirement. Complete dry unit consist of tapered,Roller Bearing,Bearing Housing with bearing,Flexible coupling Stuffing, Box with gland pulling arrangement, Lenton, Bottom tripond with teflon bush. Welding work is performed by Argon Arc process for S. S. Parts and rest electric are using suitable electrodes. Incorporated in 1996, we, Vinayak Industries are prominent manufacturer and exporter of a wide gamut of industrial machinery. In less than two decades we have achieved an enviable status in the industry. We are a sole proprietorship firm, established under the brilliant leadership of Mr. Shivbalak Vind. We lay great emphasis on the design of our products so as to provide our customers effective and long-term solutions. Our products are created using advanced technology. We follow a standardized production process so as to manufacture products that are of consistent quality. Our streamlined processes ensure maximum cost efficiency which is then passed on to the customers in terms of economical prices. We are highly principled and engage in ethical business dealings only. Our customers place immense trust in our capabilities. We export our products all over the countries.